This report shows the Sales per Staff member per month. The report is invaluable for viewing who are the Top Sales people in your organisation, either by number of orders, or total value. Could also be beneficial for helping to calculate commissions. the invoice is Paid or UnPaid. Orders with no user are classed as Web Orders. Manually created invoices are also included. 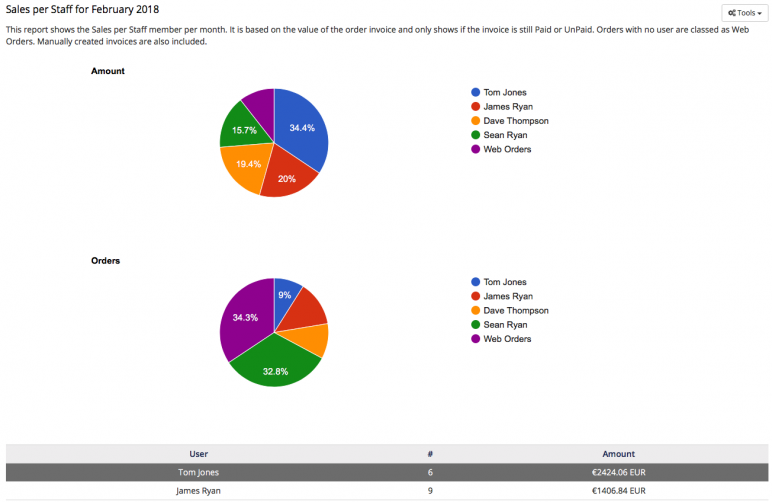 The report searches the Activity Table for New Orders and Manual invoices in a selected month, then gets the value of the invoice and presents the results sorted by Staff member. The report does not manipulate/change any entries in your database, all queries are to retrieve info. 2 pie charts are presented. The information is then presented in a sortable table. Simply unzip and place this in your WHMCS modules/reports folder and it will show in your reports. Be the first to review Sales By Staff Report. Google Analytics Conversion Tracking implement Universal Analytics Enhanced E-commerce features using Google Tag Manager on WHMCS. Scan your WHMCS and server environment to diagnose issues and adopt suggested solutions. Intercom Addon Module integrates Intercom.io customer platform into WHMCS.